In the event of a Mass Casualty Incident (MCI), where multiple victims are injured and require varying degrees of medical attention, it is absolutely imperative that first responders have a quick, easy, and reliable method of assessing victims and assigning them with an appropriate triage or priority status, based on the severity of their injuries. The MT-137 Triage Tag has been tested and proven for over 40 years to provide this method. 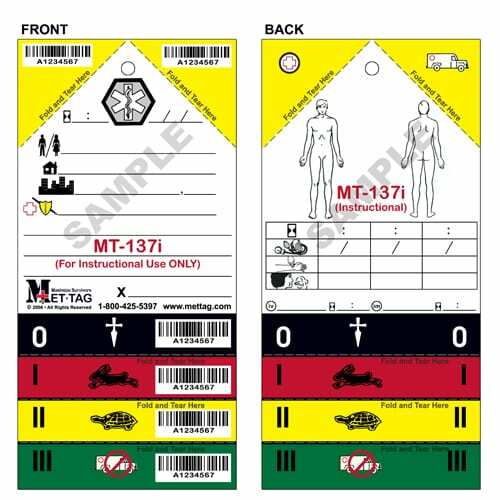 The Original MT-137 Medical Emergency Triage Tag is constructed of a high-density damage resistant synthetic material, and is printed using a special thermal printing process, allowing use in the harshest and most demanding field situations. 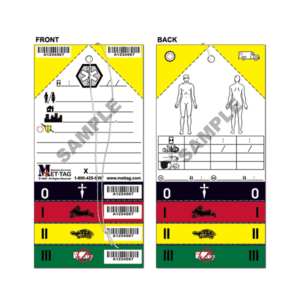 Additionally, each Medical Emergency Triage Tag is equipped with a 30-inch elastic band, which is used for attaching the tag to the victim’s body, usually around the neck or to an available limb. Each MT-137 is coded with a unique sequential barcode serial number, which aids in the identification and tracking of victims and their belongings through the various phases of the triage and treatment processes, both in the field, as well as into the receiving hospital emergency care facilities. These unique serial numbers are conveniently located on both the top right and top left diagonal tear-offs, as well as on the lower color-coded tear-offs. FOR WHOLESALE OR GOVERNMENT PRICING PLEASE LOG IN TO YOUR ACCOUNT. If you would like to be considered for a wholesale account, please call (800) 425-5397 or email info@tacda.org.